Marketers use different tools in order to get the desired response from the customers or best satisfy their needs. These tools are known as The Marketing Mix. Marketing Mix is probably the most famous term in marketing. 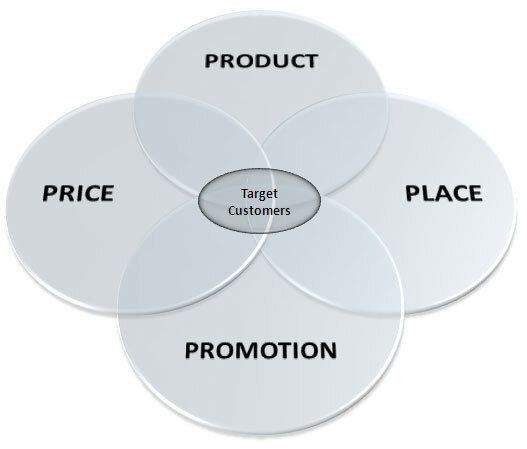 These four elements are the basic components of a marketing plan and are collectively called 4 P’s of marketing. 4 P’s pertain more to physical products than services. Below is an illustration for marketing mix. The important thing to note is that all these four P’s (variable) are controllable, subject to internal and external constraints of marketing environment. Marketers, using different blends of these variables, can target different group of customers having different needs. So, a customer may call marketing mix “the offering”. Product is the actual offering by the company to its targeted customers which also includes value added stuff. Product may be tangible (goods) or intangible (services). Using price as a weapon for rivals is as old as mankind. but it’s risky too. Consumers are often sensitive for price, discounts and additional offers. Another aspect of pricing is that expensive products are considered of good quality. It not only includes the place where the product is placed, all those activities performed by the company to ensure the availability of the product tot he targeted customers. Availability of the product at the right place, at the right time and in the right quantity is crucial in placement decisions. As these costs are huge as compared to product price, So it’s good to perform a break-even analysis before allocating the budget. It helps in determining whether the new customers are worth of promotion cost or not. It often takes time and requires market research to develop a successful marketing mix. You should not depend on one mix always try new mixes. While designing the mix, make changes to all mixes in such a way that all conveys the same message. Don’t confuse your customers by just changing one variable and keeping the rest same. Marketing mix (4 P’s) was more useful in early 19’s when production concept ws in and physical products were in larger proportion. Today, with latest marketing concepts, marketing environment has become more intergrated. So, in order to extend the usefulness of marketing mix, some authors introduced a fifth P and then seven P’s (People, Packaging, Process). But the foundation of Marketing Mix still stands on the basic 4P’s. this was really helpful in order to get my assignment done, but the limitations in the 4Ps can be expalined further and also about the 4Ps in a better way.. I anyways got the basic idea on this and developed it further with the other knowledge that i have gained..
if there is anyone out there who wants any more information about the 4Ps and its limitations, dont hesitate to contact me. helped a lot, well in! smartly-appreciated than you may be right now. You’re so intelligent. opinion consider it from numerous varied angles. Its like men and women aren’t interested except it’s one thing to accomplish with Girl gaga! All four are the key to the success but I think promotion should be at the top. After the product is designed, priced and target market is selected, then comes the real marketing strategies how to sell it.